All in all, it’s just business as usual, but with a noticeable shade of pink. In January, Forbes Magazine published an article stating 11 reasons why 2014 will be a “breakout year” for women entrepreneurs. “I think there is a trend, more women are going into business. And it’s not that women are taking over, we are just getting stronger. We’re there hooting for ourselves and supporting each other,” said Marie Cassel, owner of Sweet Marie’s Hawai`i and recipient of Kaua‘i’s 2012 Small Business Person of the Year. Between 1997 and 2013, the number of women-owned firms in the United States has grown 54.2 percent – one-and-a-half times the national average – and their revenues grew 63.8 percent, according to the 2013 State of the Women-Owned Business Report commissioned by American Express. Even during the recession, women have not backed off. Since 2007, women-owned firms are the only sector of the economy besides large, publicly traded corporations that provided a net increase in employment, the report states. The most recent Economic Census, from 2007, shows 31.8 percent of more than 8,300 businesses on Kaua‘i are owned by women. It’s 0.8 percent more than the state average and beats the national average by three percent. Since the last Census, the number of businesswomen on Kaua`i has likely grown exponentially, according to many businesswomen on the island. From left to right, Kapua Kaneakua, Maikalani Kahana and Heather Singleton are a few of a growing number of Kaua‘i women going into business. Last year, Heather Singleton, a wedding coordinator and a new board member at the YWCA, came up with the idea of the Pink Sunday, a fundraising event to empower women while promoting exposure for the nonprofit. The response from Kaua‘i’s businesswomen was so large that Singleton, who chaired the event, held in November at the Kaua‘i Veterans Center, had to turn vendors away. YWCA Executive Director Renae Hamilton called the Pink Sunday “fantastic.” The event showcased a fair, a fashion show, yoga, exercise classes, food and even a flash mob. For this year, Hamilton wants it to grow and include a broader section of businesswomen, such as architects and construction-related jobs. If anything, the first Pink Sunday was a reflection the number of businesswomen are growing on Kaua‘i. At least 50 percent of vendors were businesses that started after the 2007 Census, Singleton said. 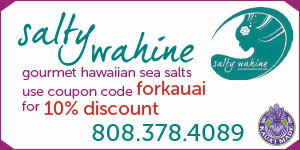 Kapua Kaneakua, owner of Mermaid at Heart, launched her business five years ago. An avid collector of vintage Hawaiian shirts – she has more than 700 – she repurposes them into handbags and also crafts jewelry using shells as gemstones. “I was making stuff for myself and people wanted to buy them,” said Kaneakua, who was born and raised on Kaua‘i and graduated from the Fashion Institute of Design and Merchandising in Los Angeles, Calif.
As a Native Hawaiian, she may have an edge over other women. The American Express report found that between 1997 and 2013, the number of businesses owned by Native Hawaiian women grew 215.8 percent, second only to firms owned by African-American women. Also, firms owned by Native Hawaiian women lead the nation in employment growth during that period, with a 122.9 percent increase. Sure, there may be disadvantages for a woman in business. Cassel said it’s still a man’s world out there, and women have to work much harder than men to earn respect. But perseverance, she said, pays off. She started her business in 2000, as a wholesaler of gluten-free foods. In 2006, Cassel opened Sweet Marie’s Hawai‘i in Kapa‘a, and five years later she moved to Lihu‘e and expanded to a gluten-free restaurant and bakery, while still selling wholesale food. Neide Pereira opened Neide’s Salsa and Samba Restaurant in Hanalei in 1998 and quickly gained a legion of followers – it is the only restaurant on Kaua‘i that serves Brazilian food. She said she didn’t encounter difficulties because she’s a woman. Opening a restaurant, Pereira said, is “a lot of hard, hard work,” regardless if it’s owned by a woman or a man. Maikalani Kahana is seen holding an ‘OPEN’ sign in front of her Mint and Sea store in Wailua. Wedding coordinator Heather Singleton is in the center, and Kapua Kaneakua holds one the bags she creates with vintage shirts. Maikalani Kahana opened Mint and Sea four months ago in Wailua, offering women’s clothing, accessories and jewelry. She too didn’t encounter difficulties as a woman. It was actually the opposite, she said; she got a lot of support from other women. “I don’t know if a man would have that if he started his own business,” Kahana said. 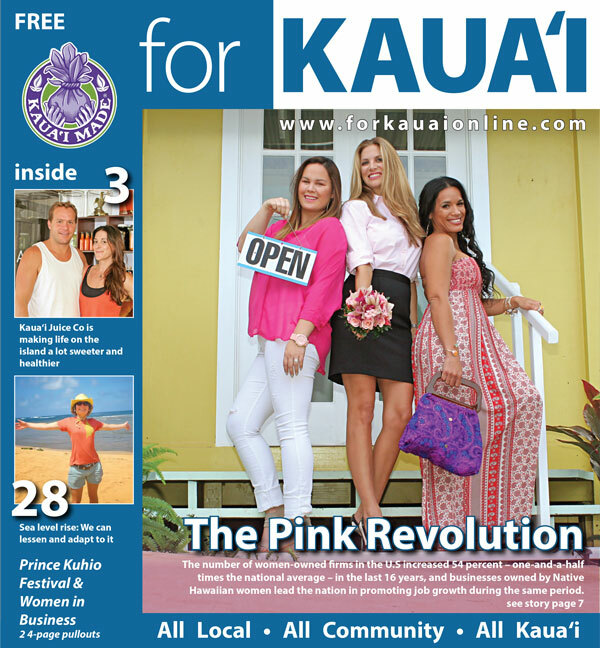 Kaikini Bikinis owner Taryn Rodighiero said sometimes women may think they can’t run a business, but the difficulties are the same ones men encounter. Her bikinis, which she personally crafts with the help of a handful of women, sell online and in local stores. “I think there are things that women bring to the business world, and there are things that men bring to the business world,” Rodighiero said. Anni Caporuscio, co-owner of Small Town Coffee and the Blue House Booksellers, both in Kapa‘a, recently spoke at the Hawai‘i Health Association Women in Business Conference. She said most small businesses are run by women, whereas bigger corporations are generally run by man. Part of the reason may be that men are more apt to start technology-based businesses, which generally attracts more loans than smaller, hospitality-based and passion-run businesses, the most common choice of women going into business. The Kapa‘a entrepreneur, however, recognizes that doors that have been traditionally shut only two generations ago are now more open than ever. “I love what I do, I know my grandmother didn’t have these opportunities, but I do. So I’m going to take them,” Caporuscio said. To Pereira, it’s all about following your dreams, “and if you focus, you can make it,” she said.